Maitripa College is Buddhist college located in Portland Oregon, that was founded by Lama Zopa Rinpoche and Yangsi Rinpoche. The aim of the college is provide integration of Buddhist philosophy into modern, western society. They offer a Masteres of Arts in Buddhist Studies, and also offer online courses that can be studied from distance. Courses include in depth studies on Madyamika (Middle Way) Philosophy, tantric classes (Vajrayana), Tibetan language courses, and techniques on Buddhist meditation. Maitripa focuses on three aspects in their curriculum: Philosophy, Meditation, and Service (community outreach programs, etc). It’s their belief that a combination of these three factors create practitioners that are wholesome and can contribute to their society. Financial assistance and grants are available to students. They also offer online courses, and the fall term will be starting soon. 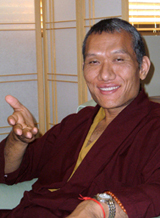 Yangsi Rinpoche is the president and principal teacher at Maitripa (Learn more about their faculty). For those unfamiliar with Yangsi Rinpoche, he was recognized as the reincarnation of Ngawang Gendun, a well respected scholar and former debate partner of the previous Dalai Lama. In this life, he studied and received his Geshe Lharampa degree from Sera Je Monastery (equivalent to a PhD in Buddhist philosophy, and was at the top of his class). After getting his Geshe degree, he continued his studies at Gyume Tantric College. He has also taught as a resident teacher at Deer Park Buddhist Center in Madison, Wisconsin with Geshe Sopa Rinpoche. This really describes Rinpoche very well. In order to be a Lharampa Geshe, one has to pass a series of rigorous tests and debates in front of thousands of monastics, and then be at the top of his class. Rinpoche’s logic is so quick and precise that he could crush anyone’s argument within 3 seconds. However, Rinpoche would never do this because he’s extremely kind and respectful with everyone he meets. I’ve never heard of Rinpoche scolding his students, and his ability to guide western students is very skillful. Many Tibetans have trouble communicating with westerners because of the cultural differences. Rinpoche knows the western mind very well, and uses a lot of terminology that we can understand. I think even if someone doesn’t get a chance to formally study with him at Maitripa, it’s still worthwhile to get a teaching from him when possible. He offers public teachings every week at Maitripa, and he teaches worldwide. He’s the director for two centers in Puerto Rico and in Seattle.